I like to experiment every once in awhile with a game or series I usually never give a second thought to playing. I am not at all considered a NASCAR fanatic. I can't quite understand what millions of people find so entertaining about four different makes of car racing in an oval for 300 laps. Don't get me wrong, I love auto racing, and I love the racing genre. When it comes to motor sport, I prefer rally racing, grand touring racing or even F-1 racing. The courses are more technical, the cars are a lot more exciting to look at, and the racing is not all about one set technique. But I figured I avoided this series too long, and I threw caution to the wind and gave Thunder a shot. While it didn't turn me into a NASCAR fan, I was pretty surprised how entertained I was by the game. Now, this isn't the most refined racing game I've ever played, and it does become repetitious, since a lot of the courses run very similar to each other. But it offers a good number of options, such as an in-depth career mode, a season mode and perhaps one of the most interesting modes: the Thunder Challenges. Here, you're thrown into a moment in NASCAR racing in which you must complete a certain goal, such as place a certain rank, avoid a huge accident, or try to make it on an empty tank. It's a great idea, and some of the challenges are truly challenging. But I'm not in love with the handling and the technique to win. The handling I just can't stand. These cars handle like tanks, and while it's not as evident on the oval courses, when you do hit the very few road courses of the game, the cars are impossible to turn over 30 mph. I'm not sure if these cars are this hard to corner in real life, but coming from racing games such as Gran Turismo 3 where many cars turn on a dime, this was something I wasn't prepared for. Then there's the important technique needed to win: drafting. I'm familiar with the technique, but this game is so reliant on drafting, and it's hard to keep behind other cars when a turn comes up every 10 seconds or so. Plus, it's hard to identify the best line in the turn to keep yourself from losing speed. For those so used to refined handling engines found in games such as GT, or used to the more forgiving mechanics of arcade racers, you may not like what you find here so much. 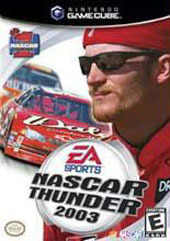 NASCAR Thunder 2003 should appease fans of the sport. It's full of in-depth modes that should keep you happy for a long time. It's also not such a bad game to try if you're curious about the sport, as long as you find it pretty cheap. I think those who have never played this type of racing game (like myself) may be put off by the real heavy feeling these cars have, and the dedication it takes to keep yourself racing in the same oval for 12 or so laps. But it's worth trying for the Thunder Challenges and the fairly robust career mode. While I prefer a little more skill in my racing games rather than driving in an oval, NASCAR Thunder wasn't as boring as I thought it would be, but it didn't keep me hooked that long, either. For die-hard fans, you'll get the most out of this. But for racing snobs like myself, try it before you buy.